Payments in the Australian construction sector take 30-60 days on average, and the level of protracted payments and insolvencies was high in 2018. Construction is a significant contributor to the Australian economy, accounting for approximately 8% of GDP. The sector is the largest non-service related industry, contributing AUD 134 billion to the economy and employs more than 1.1 million people. Nation-wide residential construction decreased in the 2018 financial year and is expected to decline further, due to overcapacity, tighter lending conditions and slowing prices. In New South Wales and Victoria residential construction is expected to be hit hard by overcapacity and deteriorating demand after robust growth in previous years. Non-residential construction is at record highs and elevated activity levels are predicted to continue. Infrastructure construction activity is currently rebounding and high levels of activity are expected in the coming five years, underpinned by public investment. The federal government has given transport infrastructure high priority as part of a AUD 75 billion ten-year infrastructure plan. However, despite solid performance in the non-residential segment the weaker residential market is expected to lead to a 10% decrease in total building activity by 2020. Payments in the construction sector take 30-60 days on average, and the level of protracted payments, non-payment notifications and insolvencies was high in 2018. In Western Australia there were many insolvencies triggered by excess supply of housing and commercial space built up during and just after the mining boom. A unit glut in Queensland led to price decreases, combined with lower demand, rising input costs and plummeting unit approvals. Loss making projects for developers and builders increased in 2017 and 2018, leading to high profile business failures. Nation-wide payment delays and insolvencies are expected to increase further in 2019. Therefore our underwriting approach remains cautious, particularly for small businesses in the residential segment and in the Western Australia and Queensland markets generally. 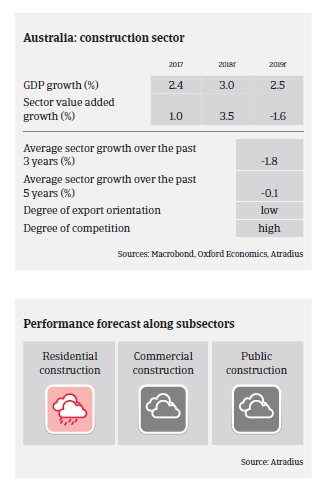 Overall, construction sector performance still needs to be closely monitored given its volatility. Payment experience over the past two years has been good in the ICT sector and the level of insolvencies is low, with no major change expected in 2018.